WORKFLOW BOTTLENECKS - How many are eliminated by the proposed software solution? TRANSACTION PROCESSING - Where, How, and Why does the vendor system improve transaction processing? 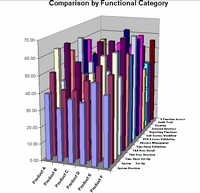 INFORMATION RETRIEVAL - How does the software improve inquiry and reporting capabilities? ADAPTABILITY - How easily can the software be adapted to changing business needs? Preferably through a demonstration. To be effective, a demonstration script (a.k.a. a demo script) should require vendors to show how their proposed software increases PRODUCTIVITY in a meaningful, measurable way. Infotivity software demonstration (demo) scripts ensure vendor demonstrations are meaningful by requiring each vendor demonstration to follow your pre-designated tasks. 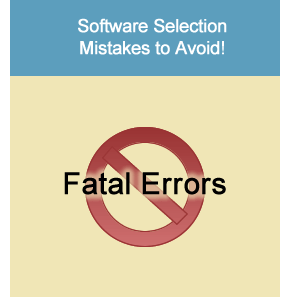 This makes software weaknesses much more visible. ENSURE CONSISTENT DEMONSTRATIONS AT THE DETAIL LEVEL by using hundreds of professionally written software demonstration tasks. No need to re-invent the wheel. 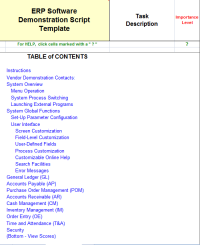 View a typical Demo Master Table of Contents. 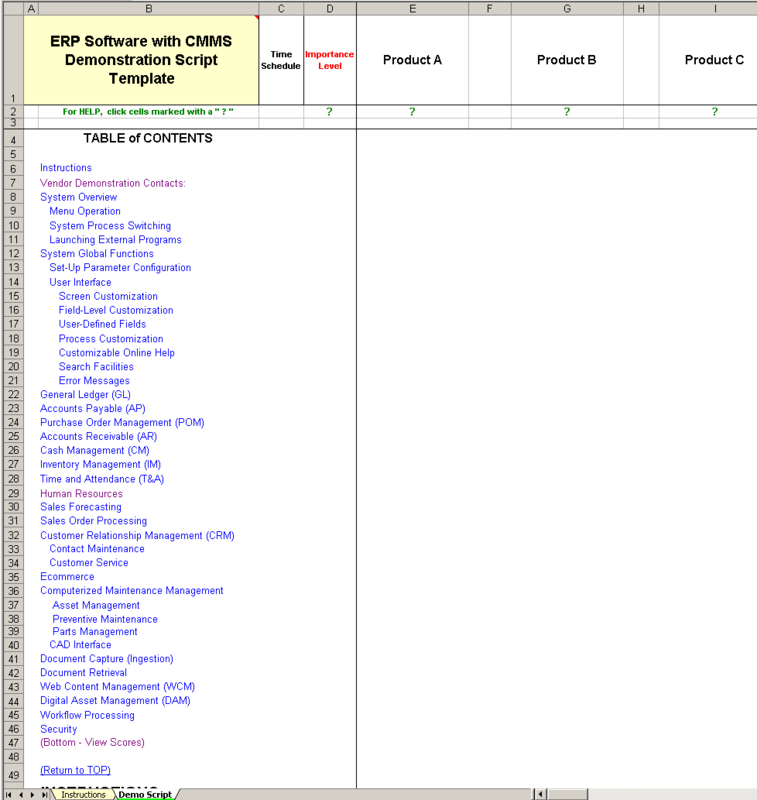 Note: Enterprise Resource Planning (ERP) w/CMMS example shown, Customer Relationship Management & others available. EASILY ENTER SUITABILITY ASSESSMENTS . Demo Masters enable users to CONSISTENTLY enter their assessment of USABILITY and SUITABILITY quantitatively and enter it in real-time during a software demonstration (presentation). View example here. 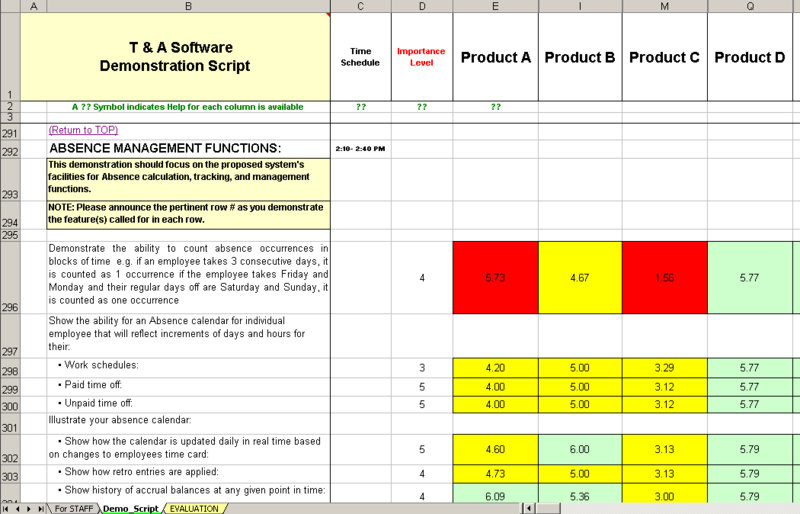 Note: Enterprise Resource Planning (ERP) demo script shown. 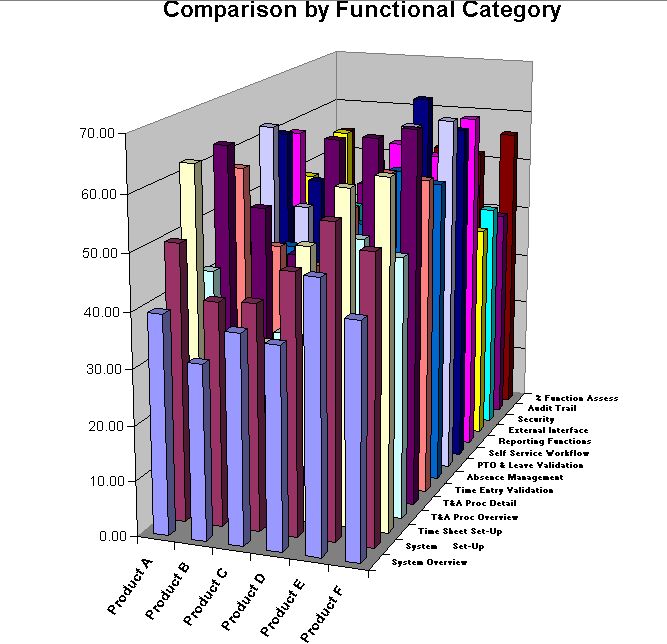 "APPLES-to-APPLES" COMPARISON of vendor software demonstrations is assured through extensive use of consistent evaluation standards and input validation. View a typical comparison here. 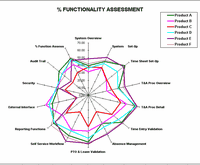 DETAILED PROCESS EVALUATION Accurately ANALYZE and COMPARE how well suited the demonstrated software system's sub-processes are to your firm's business and system requirements at the PROCEDURAL ;LEVEL. View sample analysis here. EASILY CUSTOMIZED to meet your unique enterprise content management system needs, using basic Excel techniques. Hundreds of pre-defined demonstration topic criteria help ensure each software demonstration follows the same sequence of tasks, making vendor demos easier to compare. All questions have been professionally prepared by application specialists. Unlike other demo scripts, a Demo Master enables the user to consistently enter their ASSESSMENT of the software being demonstrated. This function utilizes standard evaluation metrics to cross-reference the complexity of a given task back to a quantitative value. level. Automatically generate a weighted grade point score, based on your actual priorities, that ranks how well suited each demonstrated software system is to your organization's needs. You can view scores in detail as shown below. NEW - RADAR CHARTS SECTION. 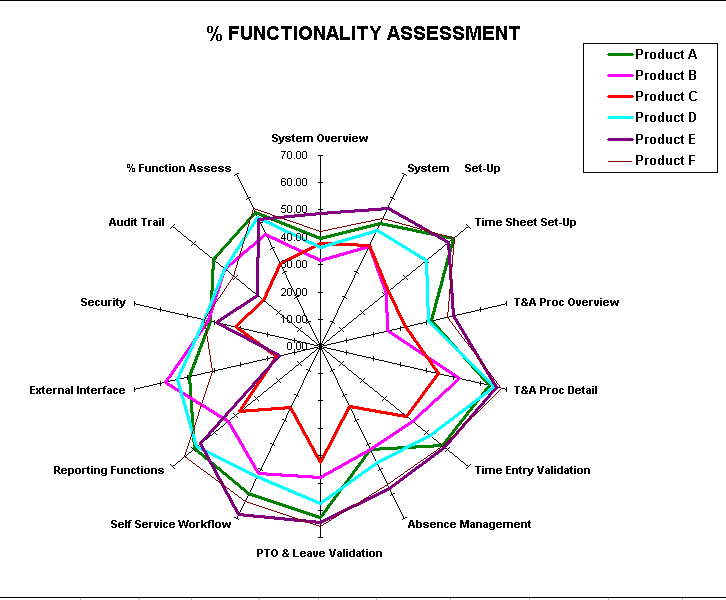 NEW - RADAR CHARTS for each vendor response that illustrate which system is best for your needs! You can view scores in detail as shown below. Quickly and easily evaluate large-scale software system demonstrations feature by feature, at the FUNCTIONALITY, PRODUCTIVITY, ADAPTABILITY, and RISK levels! Ensure unbiased, accurate, and consistent assessment of all demos. NEW - DETAILED EVALUATION SECTION. NEW - Generate DETAILED ANALYSIS REPORTS for each vendor response that illustrate which system is best for your needs! You can view scores in detail as shown below. 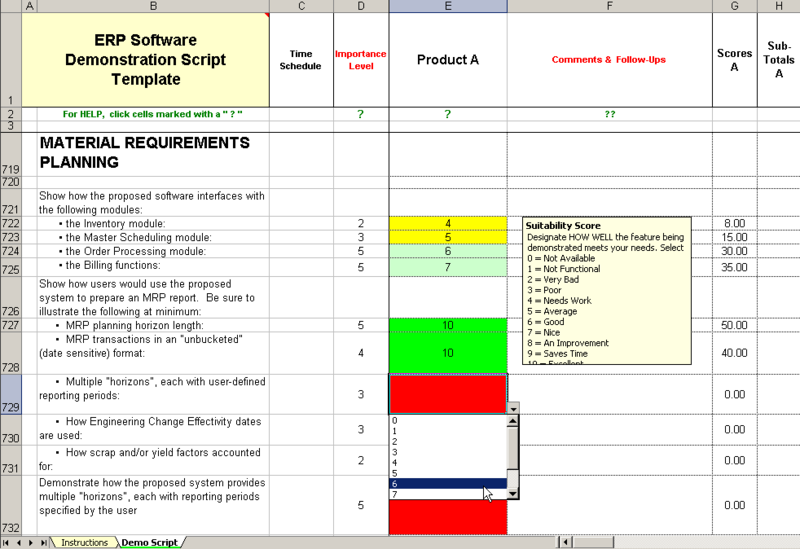 We have many software demonstration script templates. View Demo Script List Here! Return to the TOP of the Demo Script Page. "The scenarios found in the demo script, along with Infotivity's help, led to the successful outcome of our ERP software selection project." - Diane H., Natural Cosmetics Mfr. The benefits of using a software demo script. 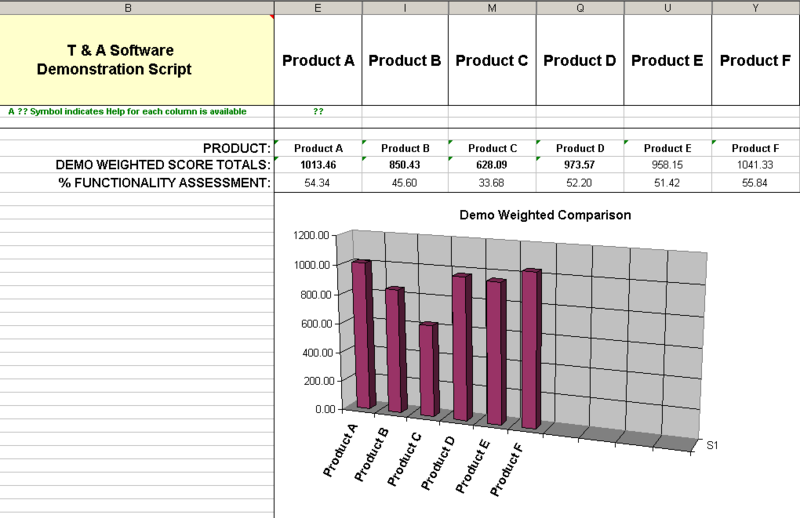 ALL the demonstration script tools & features described above, i.e., everything needed to schedule vendor demo scenarios, quickly determine assess the quality of each demonstration, calculate weighted grade scores, compare & evaluate competing demonstrations, and select the best software system demo based on your organization's needs, are included with or in each demo script!